Civicom, leading market research facilitator using telephone and web-enabled tools, is a gold sponsor and speaker at the North American leg of the Insight Innovation Exchange Conference 2018 on June 11-13, 2018 in Atlanta. Civicom’s presentation will be on the impact of the General Data Protection Regulation (GDPR) and the Facebook data management hearings on US legislation for consumer data. Civicom Market Research Services, a global leader in facilitation services that works consistently throughout EU countries as well as the U.S. and around the globe, will walk IIeX attendees through the brewing of the ‘perfect storm’ that is the Facebook Cambridge Analytica scandal and the implementation of GDPR. Rebecca West, Global Vice President and Chair of Civicom’s GDPR Compliance Committee, will offer insights into how these two convergent events may influence the future of U.S. data protection rules, and how variations in the U.S. and EU cultures may impact the appetite for data protection in the U.S.
IIeX North America is a disruptive client-driven insights conference that explores market research trends and innovations in the industry. Civicom once again joins the conference as a sponsor and speaker, showcasing their innovative suite of telephone and web-enabled market research tools alongside hundreds of insights professionals looking forward to learn more about best practices, new market research techniques, technologies, and solutions, as well as the outlook of the insight research industry in the years to come. 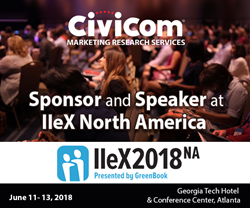 Attendees may catch Civicom’s presentation entitled “A Perfect Storm: Facebook and the GDPR – What The Future Portends for U.S. Legislation” following IIeX NA’s Track 2 on June 12 at 3:00 PM. The schedule of activities may be accessed via the following link: http://iiex-na.insightinnovation.org/agenda. Insight Innovation eXchange (IIeX) is a global conference series which is part of the Insight Innovation platform, brought to the marketplace by GreenBook. IIeX is singularly focused on advancing the business value of insights. It showcases the very best from inside and outside of the market research realm with a focus on technology innovation, thought leadership, collaboration and networking.